Your practice can exist without a mission statement, but a good practice – and one that is operating at optimal efficiency – will take advantage of an extra resource that an effective mission statement can release and activate. This resource lies within your practice team, and is often referred to as motivation, commitment and engagement. Your team will continue working for your practice, even if they do not understand or agree with its activities. However, there is no denying that your staff work and perform better if they know what they are providing and can understand and agree with the purpose of this service. Your team members want to know if their effort will add value to something much greater than the practice itself. To begin, you must establish the framework within which your mission statement operates. To understand the effectiveness of your mission statement, it is best to look at it relative to the other issues governing your practice. Your practice should have one mission, a vision to achieve it, several strategies on their way, and numerous goals to support it. Most importantly, all these must occur within the parameters of your values. In the case of a multi-disciplined practice, each area can have different missions but the governing values must be shared across the whole practice. And if they do know it, what do they think about it? This simple test will reveal how effective and productive your mission statement is in its current form. Secondly, you must establish how well communicated the mission statement is. If your mission statement is the right mission statement for your practice, it should resonate with all of your staff. You need to determine if they identify with it, and if they like it and find it useful and beneficial. It is an elementary part of our human nature to want to be part of a greater unit, and to belong to something and be useful. If your team does not relate to the mission statement, they will resent it and treat it as something foreign to them. The mission statement should provide value to your team in the form of a common purpose that is morally right. The process of focussing on and directing attention and resources creating a mission statement has a positive effect because it sends a message (providing that it is done with genuinely good intention) that as a practice you value and care about its higher purpose. If your team believes that the practice is only interested in making money, and that they are only working for that purpose, you will not receive the maximum input from your team. 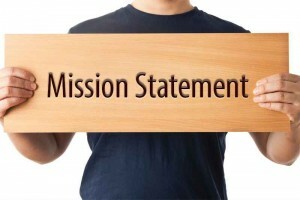 The impact of a functioning and effective mission statement is significant. It not only provides a moral framework for your practice, it also acts as a codified, accepted and recognised source of reward for performing one’s job over and above the negotiated monetary reward system; and it provides a moral reason for spending time at work above and beyond supporting one’s material existence. While it is true that money can provide reward and recognition, it is also true that money cannot always be a true reflection of effort and performance. The right mission statement motivates, energises, engages and creates commitment, which results in the creation of happiness. Happiness and wellbeing are words that are becoming increasingly popular as they represent ‘soft’ yet important values that add to the efficiency of any practice. In addition, recent discoveries in neuroscience have provided evidence that our brain is functioning at a higher efficiency when it is in a state of happiness. Capitalising on this can provide the tangible benefits of learning better and faster, and also being able to adapt to change. Once you have generated a mission statement that is the right fit, and it is known by and identified with by your team, you do not have to modify it unless you move into a different discipline. This is due to nature of mission statements, which is to provide a guiding principle for the existence of the practice. So as long as the practice exists, its principles should remain unchanged. Naturally, if you find that the mission statement does not work – meaning that it does not motivate, engage or generate commitment – then it is time to recreate and innovate it. Do you want to operate at optimal efficiency? Do you want a positive and motivated team? Then your next simple step might be to create or recreate your mission statement and our consultants at Ideal Practice can show you how.